If you are going to be arriving early in the day and would like to occupy your room immediately, we recommend that you reserve it beforehand for the previous night. The same applies to late departures: if you reserve the room for an extra night, it will be available to you until you decide to check out. If you do not wish to do this, we will happily take your luggage into safe keeping. Should you wish to freshen up, you will be welcome to use our fitness facilities. Our reception desk is staffed from 7 a.m. to 10 p.m., Monday to Sunday. 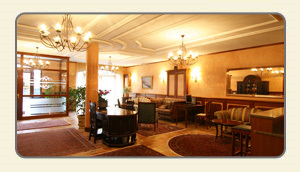 Outside these hours we operate a check-in terminal, where you will receive your room card. Cancellations must be received at least one day prior to arrival, by no later than 6 p.m. Cancellations must be made in writing and can be sent by mail, fax or e-mail. If the cancellation for a guaranteed reservation does not arrive on time, the hotel will charge you for one night’s stay. If the reservation was confirmed with your credit card details, the total amount will be credited back to you, providing you cancel on time. If your cancellation is late, we will retain the cost of one night’s stay and refund the rest to you.